The 18th-century Stott Hall Farm on Windy Hill, above Booth Wood Reservoir is situated between the carriageways between junctions 22 and 23. The road divides around the farm for engineering reasons because of surrounding geology, though a local myth persists that the road was split because the owners refused to sell the land. The farm has been nicknamed the Little House on the Prairie by lorry drivers using CB radio and by BBC Radio 2 traffic reporters. The farm is separated from the motorway by crash barriers and a high fence to keep livestock in and drivers out, after stranded motorists attempted to get aid when broken down. 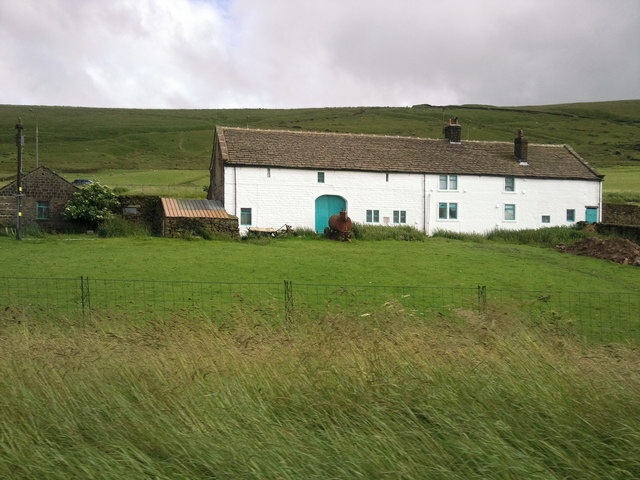 The farm was occupied by Ken and Beth Wild at the time of the motorway’s opening. It is one of the ten best-known sights on the motorway network and in West Yorkshire. The farm was used as a location for an episode of the ITV drama series Where the Heart Is and was the subject of a BBC Radio 4 documentary and a short documentary film which can be found here: http://player.bfi.org.uk/film/watch-the-farm-on-the-motorway-1983/. In December 2016 The Lad Bible talked about the reason why the farm is still there. This entry was posted in Landmarks.